Plant and Vehicle Servicing | A.P. Webb Plant Hire Ltd. If you choose not to accept cookies, you can still visit our website. Most browsers automatically accept cookies. You can prevent cookies from being stored on your hard drive by setting your browser to not accept cookies. The exact instructions for this can be found in the manual for your browser. You can delete cookies already on your hard drive at any time. However, if you choose not to accept cookies it may result in a reduced availability of the services provided by our web site. Prefer a member from our team to call you back? If so, please select the division you are interested in and leave your details behind. Someone will be in touch within one working day. which I can unsubscribe from at any point in time. 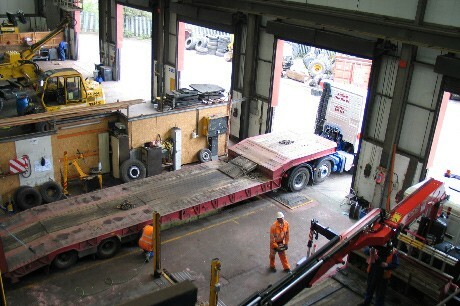 We have a large modern commercial workshop with the facilities to carry out inspections of most types of commercial vehicles, horse boxes, trailers and tractors. As well as our extensive Plant Workshop facilities, each of our Plant Fitters drive a fully equipped Field Service Van which allows for the maintenance and PDI of machines on site. We provide a Mobile Workshop free of charge on all core sites which contains mobile welder, generator, large hose making equipment and extensive parts. This negates the requirement and costs associated with external hose making companies. Our Fitters are fully qualified in NVQ level 3 Plant Mechanics and RPA assessed for Rail whilst also developing individual specialist roles. We have a strong relationship with the local college and introduce Apprentice Fitters regularly, several of whom have been awarded Apprentice of the Year.